Lots of new things happening around here! The one I’m most excited about is my new header! So if you read through email or an RSS reader, click over to Jess Fuel to check it out. Considering I did it all by myself, I’m pretty proud! You might also notice that I added a new feature at the bottom of each post which lists other post you might like. For those of you who have been reading since the beginning, this might not be that exciting. But for any new readers, I thought it’d be a good way to bring attention to past recipes that you definitely don’t want to miss! I’m aware this feature isn’t working quite right in the RSS feed, but it’s on my list of techie junk I need to figure out. Baby steps. Last but not least, I started a Facebook page! You can click here to go to the page, or scroll down on any blog page until you see the Facebook box in the right sidebar and click through to the page from there. Be sure to Like my page! I don’t have much up there yet, but I’m hoping to soon. Alright, enough of that. How ’bout some food? I woke up on Saturday really craving pancakes. 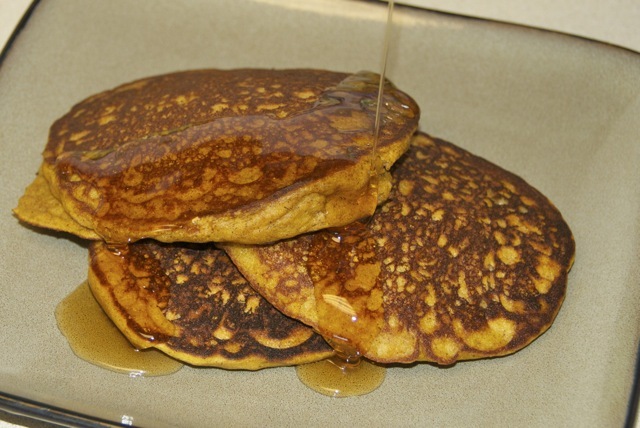 And pumpkin pancakes sounded especially good. I know the season for pumpkin has come and gone (especially down here where it feels like the middle of May), but I don’t discriminate. As I was reaching into the cabinet for some flour, debating whether to pull the all purpose for light fluffy pancakes, or the whole wheat for healthy but dense pancakes, I spotted something else. A bag of quinoa flour I bought a while ago to make quinoa breakfast cookies. I made the cookies twice, but hadn’t used the flour for anything else. Hmmm. 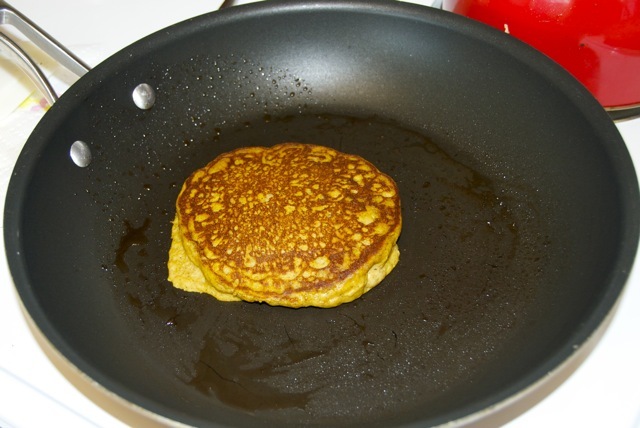 After some quick research, I learned that quinoa flour = pancakes that are healthy AND light and fluffy. Sold. 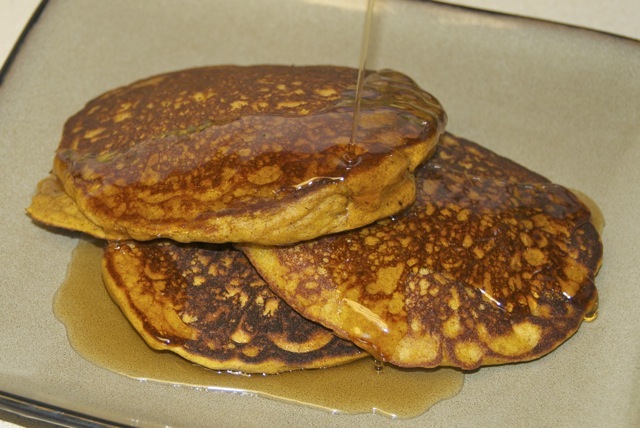 I even managed to find a pumpkin quinoa pancake recipe! In a large bowl, combine flour, sugar, baking powder, soda, allspice, cinnamon, ginger and salt and mix well. In another bowl, whisk together the milk, pumpkin, eggs and oil. 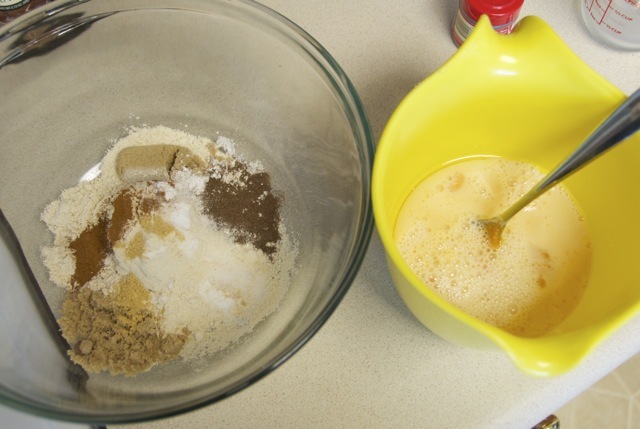 Add wet ingredients to dry and stir until just blended. Grease a large nonstick skillet and place on medium heat. When the pan is hot, ladle batter onto it. Cook until bubbles start forming in cake, then flip and cook the pancake for another 30 seconds until the center springs back when pressed. Serve with maple syrup (or apple butter, or cinnamon butter… I taste-tested all three!). The pancakes were delish. They had the light and fluffy texture of regular white flour. They did have a strong quinoa taste, but if you like quinoa flour, they were great! I had a couple left over, and they reheated nicely in the toaster oven the next day.